When they’re done right, trade shows can be a great source for business leads. When they’re done wrong, it may leave you wondering if it was worth the cost of participating. Here are some ideas to help you draw attention to your booth, generate interest in your company and convert leads into sales. It’s important to evaluate the audience attending the event. Are they consumers? Potential leads? Vendors? Industry professionals? Visit the event’s Website and study the attendee demographics as well as the room layout. It will help you determine advertising opportunities, your give-aways and handouts as well as ideas on how to attract people to your booth. Strategic marketing happens before the event to get visitors to visit you day-of-event. Promote your attendance at the show on your Website and social media channels. Use Facebook, your company blog and e-mail to let people know your booth location and invite them to stop by. Depending on the size of the show, you may want to send a postcard through the mail to potential customers and vendors. You can use the postcard as a device to get people to your booth, by providing a “gift to attendees who present the postcard. Create or use a company “mascot” or costumed character (like Home Improvement’s Tim Allen, Spiderman, etc.) to walk through the crowds and hand out a coupon to be redeemed at your booth for a prize, discount or raffle entry. You can hire an actor or have one of your staff play the part. Use a laptop/notepad to run a looped photo slideshow of your work. It can be a conversation starter and allow people to see your projects, services or products. 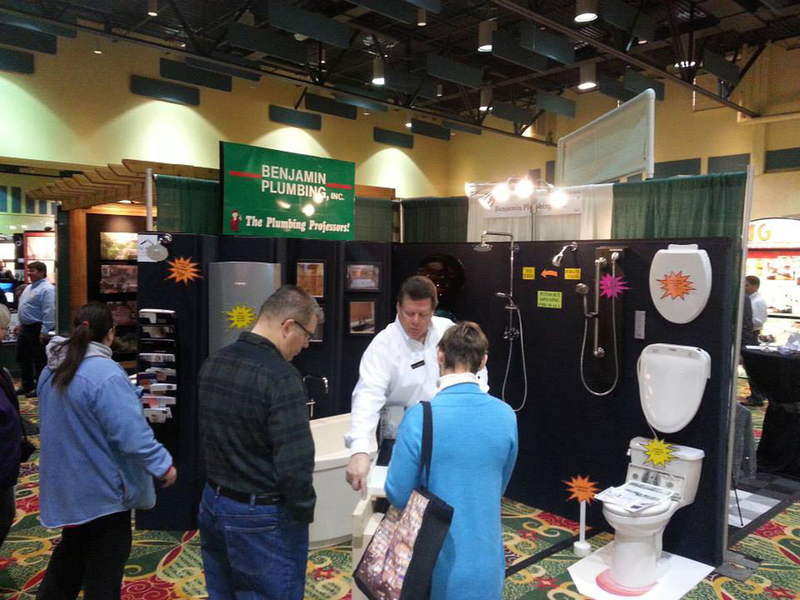 Benjamin Plumbing displayed products that consumers could touch, during the recent NARI of Madison Remodeling Expo. booth area can be a simple poster or more elaborate backdrop, which you can rent, purchase or create online with fun images from movies, gardens, European destinations, fantasy adventures—or the interior of one of your projects. If you are using a costumed character, offer photos of it with visitors your booth. Make sure your company’s logo and name are visible in the photo. Do a live demonstration at your booth—or bring a product visitors can touch and feel. Use a Fortune of Wheel game (available online) and have visitors spin the wheel. The wheel lands on different colored tabs that you can designate with different topics such as remodeling tips, fun facts about your company, candy and prizes. Create a unique hand-out. For example, you could create a calendar of the winning CotY designs or other interesting design and construction projects. This type of handout has a long shelf life with easy access to your contact information. Have a short Test Your Knowledge handout that “winners” who answer the questions correctly receive a prize. The quiz can provide the opportunity to start conversations about the answers. Be sure to have winner and consolation giveaways. If you think the booth might get too busy, you can list the answers on the flipside of the quiz. The goal is to have an ice-breaker to start conversations. Use the event’s hash tag on Twitter to Tweet time-restricted benefits: “The next 5 people to stop at XYZ Kitchen Design Booth 112 and say ‘I love my kitchen!’ will get a free water bottle! You can also use Twitter to entice visitors by posting a photo of your giveaways or encourage them to enter your raffle.